4 WARD-BECK WBS M460M MIc/ Line Preamp & EQ Channel Strips w/ Rack & PSU #27405. 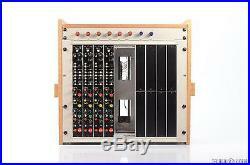 DESCRIPTION - This listing is for a 4 WARD-BECK WBS M460M Mic/ Line Preamp & EQ Channel Strips w/ Rack & PSU. The four channels are actually housed in the original console "bucket" which has also been mounted in a makeshift wood rack. The bucket just happens to be a standard 19 wide so you could very easily and nicely mount this in any standard rack case. With that, the bucket has an additional 4 powered slots for you to literally "plug in" 4 more channel strips, add to that and there are 2 more empty spaces for future expansion as well. These last 2 slots would need power connectors, but the space is there for a total of 10 Channels! What makes this package even nicer is that the power supply is one of the two the original power supplies for the console. It too is mounted in a nice 4 space rack. Connectivity is plug-n-play with an Elco connector mounted on the back of the rack and the included Elco to 8 Channel XLR Snake 8 Channel "IN, 8 Channel "Out", and 8 Channel "Line in. If you have been considering getting into getting some Ward Beck Preamps because you've heard the legend of how they have the bottom end of Neve and top end of API, then this package makes an ideal start to build your channels. It is not likely that you will find a more pro set-up. ACCESSORIES - Includes preamp section bucket and channels, power supply in 4 space rack, custom Gepco Elco to 8 Channel XLR Snake cables. PHYSICAL CONDITION - Very Good: There is some ingrained dirt in crevices, scratches and blemishes, normal wear, but it all looks very good, especially for a vintage piece. WORKING CONDITION - Very Good: All four preamps and EQ sections are working great. 1 On/Off switch is not working (channel is always on), the 2-4 channel on/off switches are working fine. The phase switch LED lights do not work as they are not tied into the power section, but the phase function and switches are functional. The leftover routing, pan, and other old console features are not operational as they are not hooked up and not needed. What you are getting are an active EQ and Preamp section with each channel. We offer a 100% satisfaction guarantee. Techno Empire reserves the right to. We do our best to test each piece of gear and describe it as accurately as possible before listing it. We take lots of detailed photos so that you can make the fairest evaluation of the item's physical condition using your own skilled observation, independent of our techs qualified, yet subjective, opinion. We strongly suggest that you check your order after receiving it to be sure that it is in proper working order. NOT WORKING, FOR PARTS, OR AS-IS. We do our best to fairly evaluate the condition of a non-working item and give an honest description of any symptoms. If there are any further conditions, missing parts, or dead-issues with the item that are not described in this type of listing, Techno Empire will not be held liable for it. It does not cover such things as normal wear and tear. Incorrect voltage, un-authorized or self-repair, exposure to extreme temperatures, moisture damage, failure to follow manufacturers instructions or incorrect application etc. Loss from theft or loss from loss you like that one? It was stated above, but it is worth stating again. Techno Empire will not be responsible for the improper use or incorrect voltage applied to electronics. If an item we sell to you is not rated for the voltage of your country, it is your responsibility to get the correct voltage transformer to operate the item correctly. Otherwise damage could result, of which we will not be held responsible. We take your privacy and confidentiality seriously. We also accept all major credit cards. Please inquire for a special quote. Direct signature on packages is an option. Packages lost due to theft or loss are not the responsibility of Techno Empire Inc. Examine all boxes upon receipt by the carrier before acceptance. Carrier must note any damage to the box on a release form or you can refuse acceptance. Any items that you receive that have exterior damage to the box or damage to the item, or missing parts or accessories, please report this immediately to customer service at Techno Empire. Please keep all packing materials, accessories and merchandise tags for any item you want to report a claim. Please inquire for rates if you do not get a rate from the calculator. Techno Empire will not be responsible for any packages that are lost, stolen, or damaged in International transit. Regardless of any misrepresentations made or perceived to be made by Techno Empire. Return item must be repackaged for safe return with the same care and expertise in which you received it. Return items must be insured for at least the value of the item. When you receive the item, please don't tear into it like a heavily-caffeinated seven year old Edward Scissorhands on Christmas morning. Be mindful to open the package carefully using a sharp box cutter and observing not to tear up the sealed internal packaging also. For instance, if it is rack gear, we would recommend avoiding racking it until you were certain it was a "keeper". Thus preventing any possible "rack rash" or scratches. Although tempting, put down the extra sauce and cheese deep dish pizza that is dripping all over your leather vest and beard and be sure your hands are clean and dry before trying out your awesome new gear. Pet odors, cigarette and other smoke items can also affect the "newness" of your gear. Also, keep the gear away from your friend with the Billy Ray Cyrus mullet driving the Camaro. He's a good guy and he means well, but years of smoke tar and beer bongs have dulled his perceptions. So please use common sense and think in terms of preservation of the item until you are certain you are keeping it. We take lots of detailed photos so you can make the fairest evaluation of the item's physical condition using your own skilled observation; independent of our techs qualified, yet subjective, opinion. Incorrect voltage, self-repair, exposure to extreme temperatures, moisture damage, or incorrect application, etc. Earphones, microphones or other items that have intimate mouth, face or body contact. Software, computer hardware, computer drives and other digital or media tape. Items which are special orders, discontinued, close-outs, or "as-is" items are all non-returnable. HOW TO RETURN YOUR ITEM. The item "4 WARD-BECK WBS M460M MIc/ Line Preamp & EQ Channel Strips with Rack & PSU #27405" is in sale since Friday, December 23, 2016. This item is in the category "Musical Instruments & Gear\Pro Audio Equipment\Preamps & Channel Strips". The seller is "technoempire" and is located in Burbank, California.